Grace Farrell. Lillie Devereux Blake: Retracing a Life Erased. Amherst and Boston: University of Massachusetts Press, 2002. 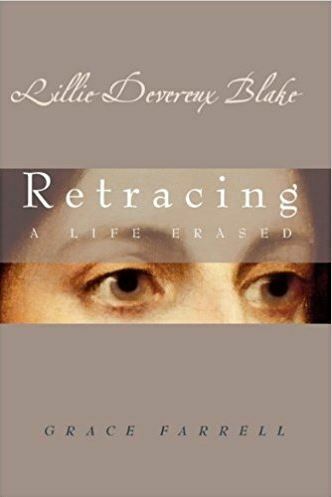 Lillie Devereux Blake: Retracing a Life Erased is a biography of suffragist and writer Lillie Devereux Blake, written by Dr. Grace Farrell, a professor of English at Butler University. Fiction writer, journalist, and essayist, Lillie Devereux Blake (1833–1913) published seven novels, two collections of stories and essays, and hundreds of other pieces during her lifetime. She also played a major role in the struggle for women’s rights, eventually becoming Elizabeth Cady Stanton’s candidate to succeed Susan B. Anthony as president of the National American Woman Suffrage Association. Yet for all her remarkable accomplishments, Lillie Blake’s story has been all but forgotten. As Grace Farrell reveals in this richly textured biography, Blake’s creative writings did not survive the canonical purges of women authors at the turn of the twentieth century, and her contributions to the suffrage movement were simply ignored in the official histories sanctioned by Susan B. Anthony. From the traces that remain, Farrell reconstructs an extraordinary life of passion and purpose. She chronicles Blake’s literary career from Civil War correspondent to novelist and provides an inside view of suffrage politics, correcting some long held misconceptions perpetuated by Anthony and her supporters. At the same time, Farrell expands the generic boundaries of biography by recounting not only a life and the causes of its erasure but also her own process of recovering that life. She brings the reader along with her as she follows Blake’s path in the world, touches her diary, reads her letters, and campaigns to prevent Yale University from demolishing Blake’s childhood home in New Haven. Also see this review from H-Net Humanities and Social Sciences Online. Google Books offers a limited preview of the book. You can also purchase the book from a number of online sellers, including Amazon.com and Abe Books. It is no longer available for purchase from its publisher’s website.